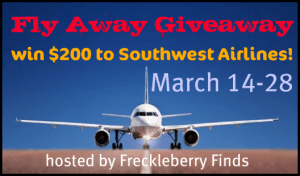 Blogger sign ups are open for the Fly Away Giveaway Event hosted by Freckleberry Finds. This one sounds like it will be fun and I don’t think I’ve ever seen this prize being given away before! Fill out this form and send your payment to [email protected] as a gift. Make sure to put your blog name in the notes. Registration closes on March 11. Visit Freckleberry Finds for more details! Please note this is sign up for bloggers to participate in the actual event and NOT for people to enter. The giveaway in March will be free for readers to enter.